Kevin McGuire » Blog Archive » Introducing, Sarah! I’m not sure why Patti kept checking the B.A.R.K website, I knew it could only lead to one thing… a dog. We’re both suckers for sad dog stories and it was hard not to adopt each and every one of them. But the plan was to get a Bernese Mountain dog pup in the spring. Patti had even researched a breeder who we had gone out to meet, and Deb and Mike actually ended up getting one (Rosco!) from that breeder last summer. 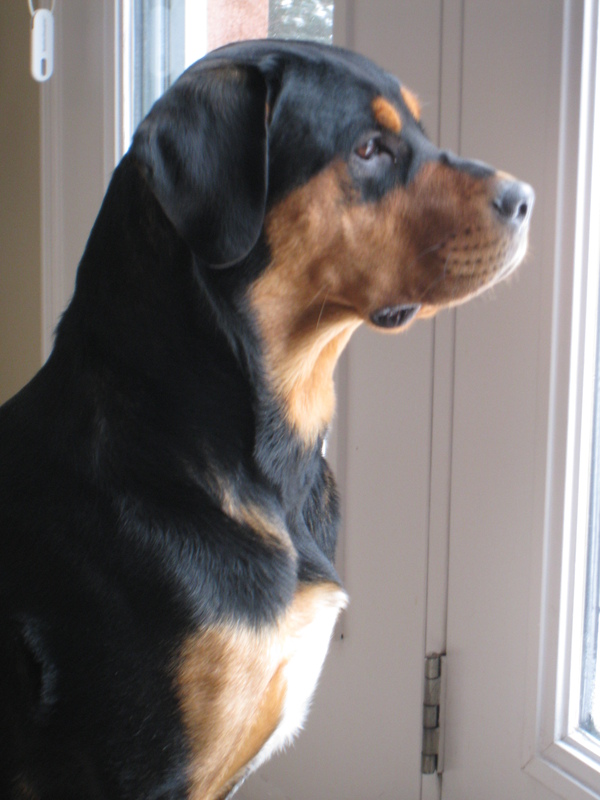 But over the holidays Patti saw a notice on the site saying that they were looking for a foster for two Rottweiler females rescued from a puppy mill outside of Montreal. If they didn’t find a foster by Jan 3 then they’d have to put one or both in a kennel. Well I mean the poor things just made it out of jail, we couldn’t have them sent back! So on Jan 1 we went to see the two dogs with the plan of “just fostering” one. There was a smaller and younger one named Molly Maguire (“Destiny?”, we thought?) and a larger two year old named Sarah. They were both lovely dogs and in the end we came home with Sarah. It only took four days for us decide that we wanted to keep her. 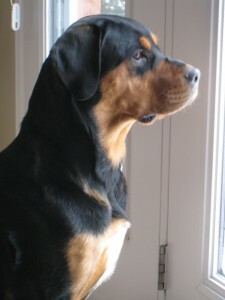 She has such a sweet disposition, no sign of aggression at all, and a willingness to please quite rare in a Rottweiler. When we announced to all that we decided to keep her, well let’s just say it seemed we were the last to know. She’s very affectionate, and very smart. The site described her as a “gentle giant” and that she is. OK sometimes she thinks she’s a lapdog… ooph! She’s settled down nicely and you can tell she knows that this is now her home. We’ve been doing lots of training and she just looks so proud when you praise her for being a good girl. That, and morning snuggles … this is the life she was supposed to have! This entry was posted Tuesday, February 10th, 2009 at 8:13 pm	and is filed under Uncategorized. Both comments and pings are currently closed. Hi Kevin. Roo sent me this this morning; FABULOUS news!! Congrats to you and Patti. Can’t wait to meet her.